The Kansas Learning First Alliance (KLFA) is coalition of organizations in Kansas representing school boards, administrators, teachers and teacher educators, parents, and the Kansas State Department of Education. Founded in February 1999, this group is affiliated with the national Learning First Alliance. 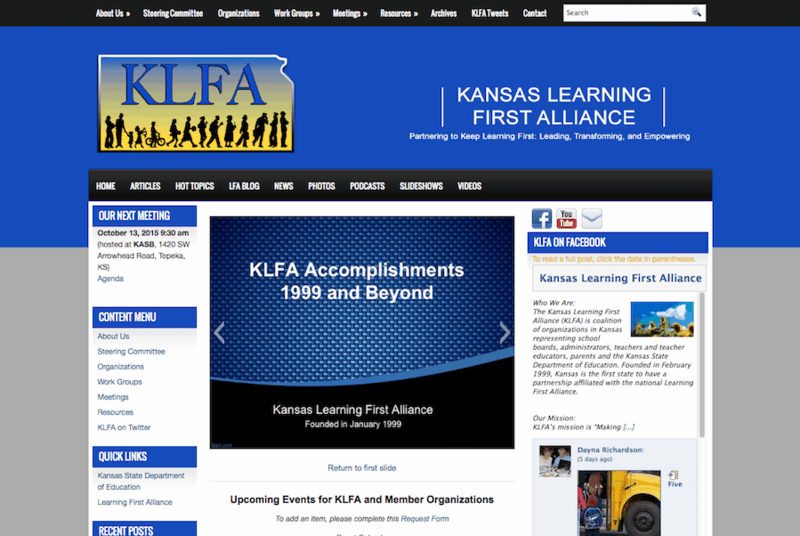 When the KLFA officers approached me about a new website design, they had a lot of special requests. Together, we made a list of features desired, created possible menu and page lists, and developed a work flow for the people who would maintain the site. As part of the process, they designed a new logo which is the centerpiece of their website, available at the link below.